From the UK made wrought iron lighting range. 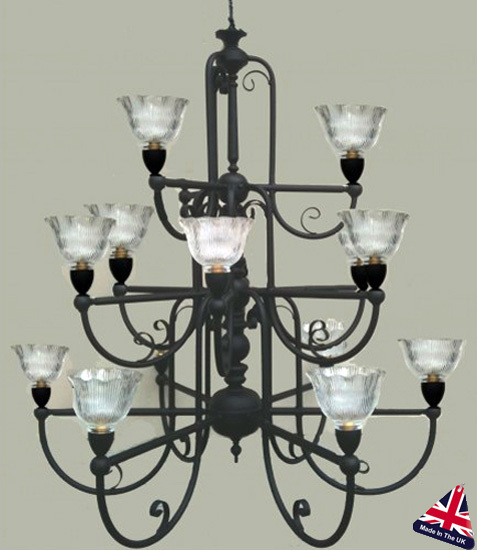 Fantastic quality very large feature wrought iron three-tier replica gassolier with fluted ribbed glass shades. With a large diameter of 1100mm, this impressive replica Victorian wrought iron chandelier has two-tiers of six lights and a top tier of three. With heavy stacked braced arms, this magnificent light fitting is an imposing 1270mm high without the chain. The dimensions shown are for the light fitting only and exclude the chain. Supplied with 1000mm of chain but can be supplied with any length to suit your needs, please specify the chain length required in the special instructions box at the checkout.